New two-dimensional materials, with breakthrough magnetic and electrical attributes capable of making them building blocks of future quantum computers and several other improved electronics, have been fabricated by physicists at the University of California, Irvine. UCI researchers and colleagues from UC Berkeley, Lawrence Berkeley National Laboratory, Princeton University, Fudan University and the University of Maryland investigated the physics behind the 2D states of novel materials and then concluded that they could push computers to new heights of power and speed. This has been discussed in three separate studies appearing this month in Nature, Science Advances and Nature Materials. Finally, we can take exotic, high-end theories in physics and make something useful. We’re exploring the possibility of making topological quantum computers for the next 100 years. The common threads running through all these three papers are that the research is performed at very cold temperatures and that the signal carriers in all these studies are not electrons – as with conventional silicon-based technologies – but Dirac or Majorana fermions, particles without mass that travel at nearly the speed of light. The process of handling and analyzing miniscule material samples, only two atoms thick, a few microns across and several microns long is considered to be one of the key challenges of such research. A fiber-optic Sagnac interferometer microscope, built by Xia, is available in his lab. The only other one currently available is in Stanford University, assembled by Xia when he was a graduate student there. Xia, referring to this as the most sensitive magnetic microscope in the world, compares it to a telescope that an ornithologist in Irvine could use to inspect a bird’s eye in New York. In a recently published study in the journal Nature, the researchers presented a detailed observation – through the Sagnac interferometer – of magnetism in a microscopic flake of chromium germanium telluride. The compound created by them was viewed at -387 °F. CGT is considered to be a cousin of graphene, a superthin atomic carbon film. Graphene has been considered to be a potential replacement for silicon in next-generation computers and various other devices due to the speed at which electronic signals skitter across its surface that is almost perfectly flat. However there is indeed a catch: A few computer components, such as storage and memory systems, should be developed from materials that have both electronic and magnetic properties. CGT has both, but graphene only has the former and not the latter. The Sagnac interferometer was used by this lab for a study published earlier this month in Science Advances. This study analyzes what happens at the precise moment nickel and bismuth are made to contact with one another – again at an extremely low temperature (in this situation, -452 °F). Xia’s team discovered an exotic superconductor that breaks time-reversal symmetry at the interface between the two metals. Imagine you turn back the clock and a cup of red tea turns green. Wouldn’t that make this tea very exotic? This is indeed exotic for superconductors. And it’s the first time it’s been observed in 2-D materials. The signal carriers in this 2D superconductor are Majorana fermions capable of being used for a braiding operation that theorists assume is important for quantum computing. “The issue now is to try to achieve this at normal temperatures,” Xia said. The third study proves to be promising in overcoming that hurdle. In 2012, a radio-frequency oscillator built around samarium hexaboride was delivered by Xia’s lab to the Defense Advanced Research Projects Agency. The substance is an insulator on the inside but permits signal-carrying current made of Dirac fermions to flow freely on its 2D surface. 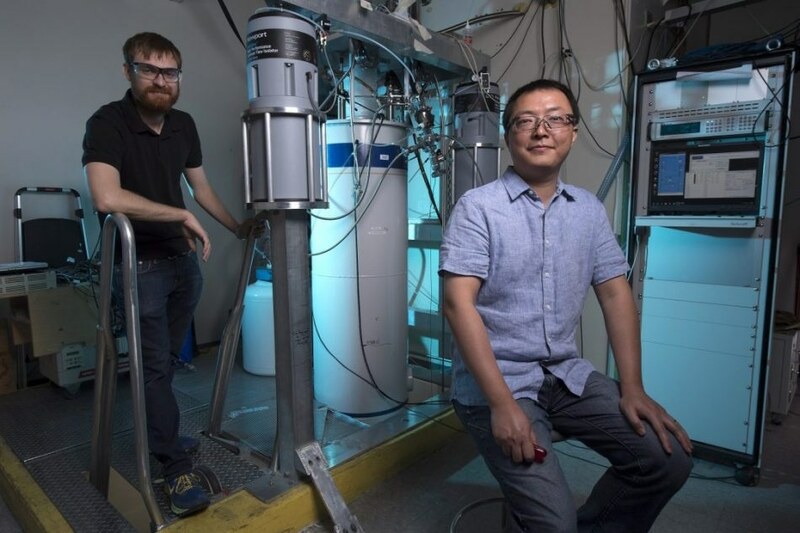 UCI researchers used a special apparatus built in the Xia lab – also one of only two in the world – to apply tensile strain to the samarium hexaboride sample and showed proved in the Nature Materials study that they could stabilize the 2D surface state at -27 °F. Believe it or not, that’s hotter than some parts of Canada. This work is a big step toward developing future quantum computers at nearly room temperature. The National Science Foundation funded UCI’s involvement in the three studies. The U.S. Department of Energy provided additional support.